Original 1st printing 10 x 19" concert/event poster for the 7/26/1969 Eugene Pop Festival, held at Hayward Field on the campus of the University of Oregon (Eugene). 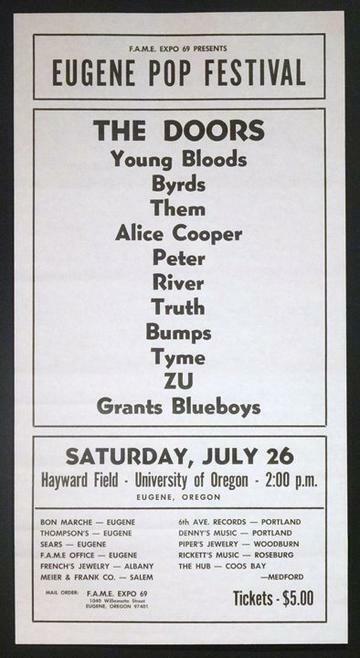 Designer unknown, boxing-style marquee poster lists festival participants the Doors, the Byrds, the Youngbloods, Them, Alice Cooper, River, Zu, Truth, Bumps, Tyme and Grant's Blueboys (many of the acts were shuffled/replaced, but the Doors definitely played). ULTRA-thin flat index stock poster is in excellent (B+) condition; aside from a touch of handling wear and 6-7 ultra-soft horizontal roll bends, this example is just about as clean as they come.